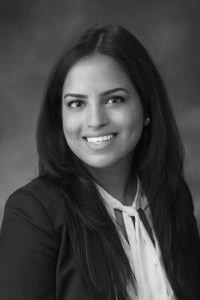 Bela A. Dalal joined the attorney team at Potestivo & Associates, P.C. in September 2017. Bela serves as an Associate Attorney, assisting the firm’s Illinois Foreclosure Department located out of the Rochester, MI office. Bela graduated with B.A. in Political Science – Prelaw from Michigan State University, before receiving her J.D. from the University of Detroit Mercy School of Law in 2015. During her time in law school, she was a member of Detroit Mercy’s Law Review and Vice President of the Women’s Law Caucus. Prior to her time at Potestivo & Associates, P.C., she spent time as a Document Review Attorney for a large corporation in Southeast Michigan, where she was responsible for reviewing and analyzing complex legal documents for certain cases. Bela is a member of the Michigan Bar Association, Illinois State Bar Association, and the Women Lawyers Association of Michigan. As a first generation Southeast Indian, she wants to dedicate her time and energy towards providing pro bono services within her community. Outside of the office, she plans to take her legal knowledge that she has acquired and in turn, help those in the community who are in need of legal advice and aid.